Snoopy and Belle by Karl Lagerfeld. Photos by Yours Truly. Snoopy and Belle by Hermes. THE siblings canine are dressed to kill in their black evening finery. Ready to disco in their shimmering silver. And between galas and parties, they are a sporting pair in what looks to be golf garb. 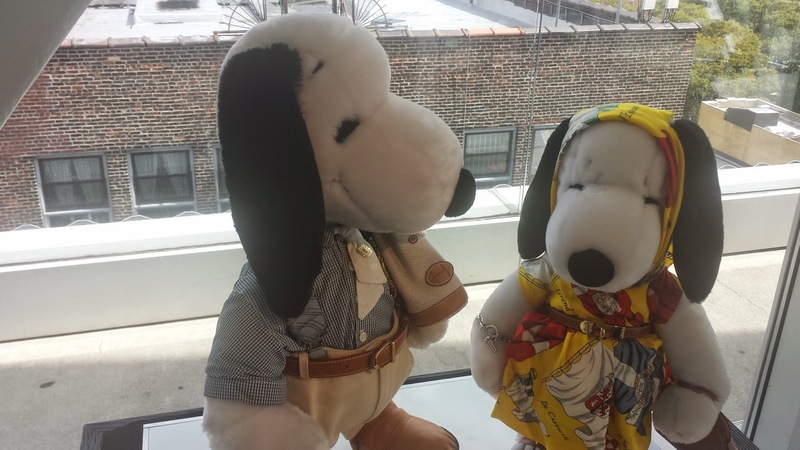 Regardless of the getup, Snoopy and Belle are turned out in high style, courtesy of some of the world's top designers. Rachel Kapur and Betsey Johnson have a tête-à-tête after the designer looks over her pieces. 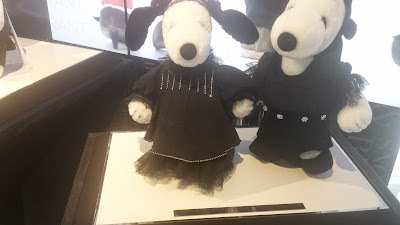 Welcome to the second edition of “Snoopy & Belle in Fashion presented by Metlife.” It is among a number of Peanuts-related entertainments, timed to coincide with the 65th anniversary next year of the Charles Schulz comic strip. Snoopy and Belle by Gucci. 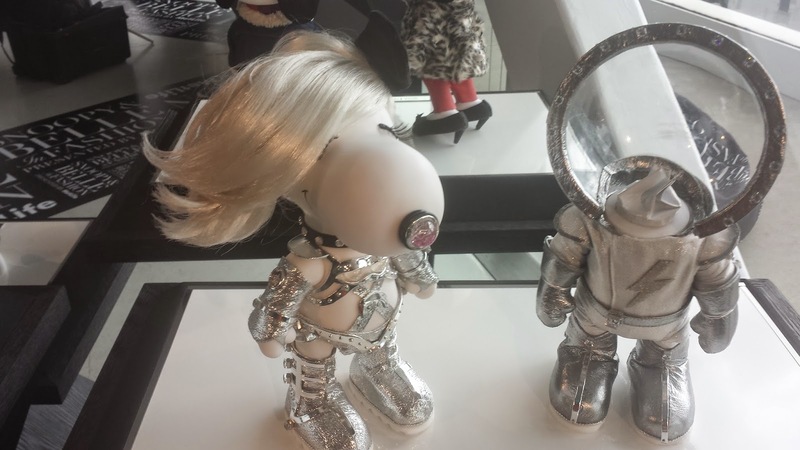 Betsey Johnson, the talent behind four Snoopy and Belle ensems, is here in this space offering some enviable views of the Lower East Side and Soho. The designing men of Costello Tagliapietra are lumbering about in their plaids. Fresh off of the successful showing of his Spring-Summer 2015 line, Christian Siriano is stealthily moving about, trying to make himself feel smaller than ever. And Tyson Beckford is standing here and there in fine, v-shaped form. Almost from the beginning, Snoopy fans began demanding a wardrobe for their plush doll. A few years after Belle hit the fashion scene, an executive from the company that had heretofore been producing the frocks reached out to some of the world's top designers, no doubt humbly asking whether they would deign to design some threads for a pair of dogs. Snoopy and Belle by Royal Asscher X Pluma. The response was enthusiastic and that first world traveling exhibit was born in 1984. The class includes Giorgio Armani, Karl Lagerfeld and Oscar de la Renta, who is presenting his Spring-Summer 2015 collection this evening. Thirty years later, it seems fitting for a redux. The new class includes Siriano, Zac Posen, Tracy Reese and Rodarte, also showing today during Mercedes-Benz Fashion Week New York. 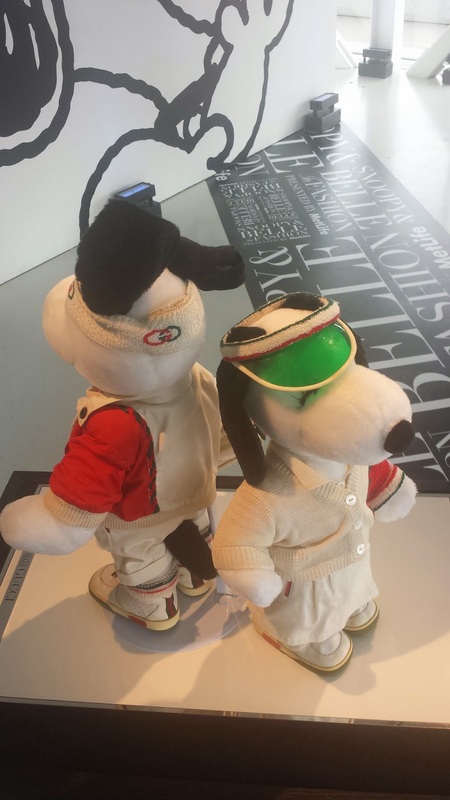 “Snoopy and Belle in Fashion presented by MetLife,” free and open to the public with reserved ticket, journeys to the Palais de Tokyo in Paris after it quits New York. Other stops are Milan, Moscow and Tokyo on a two-year tour that is still being worked out. Visit http://www.snooopyandbelleinfashion.com to learn more about “Snoopy & Belle in Fashion presented by Metlife,” including ticket information.